Bowser's up to no good again...but this time, it's Princess Peach to the rescue! When Mario, Luigi, and the Mushroom Castle Toads get kidnapped, it's up to Peach and her magical umbrella to save them. Feel the vibes! Use the touch screen on the DS to channel Peach's emotional vibes into special walls when she's mad, or make vegetation grow with her tears! Save Mario! Join the princess as she runs, jumps, floats, and fights her way through eight worlds, from Fury Volcano to spooky Shriek Mansion. Keep your eyes peeled! 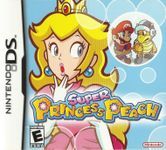 Every area hides secrets, including Touch-Screen minigames, cool puzzles, and plenty of power-ups for both Peach and her umbrella!"